Numerous acoustic enclosures for an array of ‘Liner & Scorer Machines’ within a bottle capping facility operated by a major closure manufacturer in the middle east. The units are to be supplied / shipped in flat-pack form for on-site assembly around the existing machinery and its associated ancillary /auxiliary equipment. When fully assembled, the enclosures are to accommodate a variety of entry/exit service penetrations at roof level, for the numerous automated conveyor lines. The assembled enclosures are to be fit for purpose in providing a safe working environment for operations and maintenance personnel. Quick & easy access is vital on a production line of this type and hence a variety of options was used to accommodate the client’s requirements, including single and bi-folding doors, hinged maintenance hatches, quick-release removable panels etc. The enclosures are to integrate with the equipments existing ventilation system, thus ensuring that the enclosed machinery continues to operate in a normal manner. The `Liner & Scorer Machines' each had an operational noise level of 95dB(A) at 1 metre. 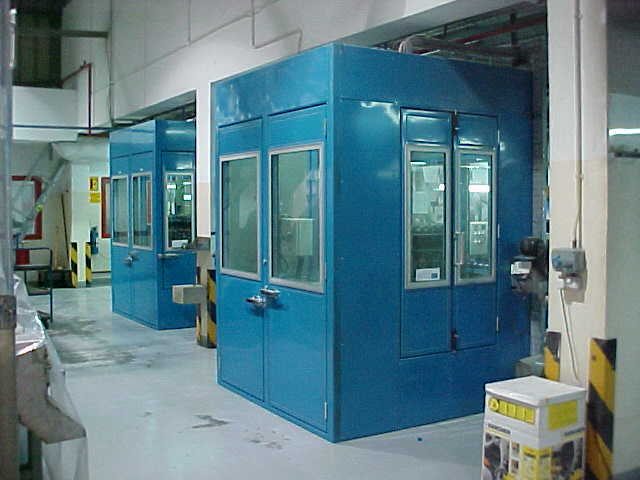 The enclosures provided a minimum noise reduction of 25dB, bringing the noise level of individual machines down to 70dB(A) and overall factory noise levels well below 80dB(A) - thereby exceeding the customer's requirements and fully meeting national and international standards.